But while there are admittedly hundreds of party and reception options at SXSW, Porter Novelli is hosting one we think is unique and can help do some good in the world. On Friday night March 7, Porter Novelli will host our first annual charity poker tournament — PNSXSWPoker. That night, we’re hoping that members of the media, digital influencers, clients and SXSW attendees will be able to sit down together for a fun evening of casual poker and a somewhat quieter, more intimate networking environment. 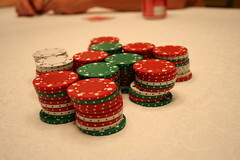 Best of all, there’s no way to lose money that night – because all your chips come with just entering the event. All we’re asking is that the “ante” be a $50 donation to charity:water and our #PNSXSWPoker campaign for them. Your donation will go toward the drilling of a well in Kenya that will provide clean drinking water for 200-250 villagers who currently don’t have access to safe or clean water. If you’ve never had to worry about being thirsty or having clean and safe drinking water, you can’t know just how much it will mean to the people in this Kenyan village that we’re able to help them with this well. Think of the lives we can change or even save, just by playing poker! Here’s how it will work. You donate $50 to #PNSXSWPoker, and we get the list of who’s donated. Once you donate, you’re in. You show up at the Rattle Inn on West 6th St. at 6 pm on Friday night, March 7, and you get your seat at the table. You’ll play – the drinks are on us – until you’re eliminated. Nobody will get real money out of this tournament, no matter how well they do – all the poker proceeds go to charity:water. In the meantime, you’ll get to network with members of the media, with representatives of Porter Novelli and with fellow attendees of SXSW — all in a fun setting that is a little more conducive to talking than a massive party with hundreds of guests in various states of inebriation and loud music thumping in the background! Plus, thanks to our partners with our client DoubleDown Casino (the best online poker game on the Internet, in our opinion! ), you’ll have the chance to get free credits to continue honing your game by playing online at DoubleDown Casino. Who knows – we might even be able to provide a poker tutorial from someone who knows the game pretty well! So ante in, brush up your skills, help us help charity:water help some deserving people in Kenya, and we’ll see you on March 7! This blog post originally ran on the Porter Novelli Blog. Christopher Barger is a Senior Vice President of Global Programs at Voce Connect, a division of Porter Novelli.